I think it's freakin' gorgeous! Seriously! And yes, it's been super hard to find! 2. More importantly, the linear holo gives me convulsions. Seeing this baby in full sun will probably cause me instant death so it's a fair trade :p I wouldn't even know where to start looking for this gem. Thanx for the giveaway and hope I win :). I love and have been lemming this polish for a long long time. I found it on ebay as it is virtually the only place one can find it and was thinking about buying it there eventually. I live in the US and haven't seen a bit of gosh anywhere! I would love to win this polish because it is sooo gorgeous! Ever since I saw swatches of it online I have been gaga over it. I live in the U.S. and there is no Gosh anywhere here...(at least that I know of) and I missed out on the China Glaze OMGs back when they came out so I NEEEEED a holographic polish in my life. I dont have any linear holos in my collection at all! Its crazy, I know. It's not only the effect that I love, it's the fact that it's a rainbow! so pretty! I'd like to win this polish because if you can believe it, I don't own any holos and this one is probably the most impressive that I've seen! And yes it's been hard to find, I don't think Gosh is even available in the US? I would really love to win this because I have never tried holographic polishes before and I cannot get this particular one here where I live, no one here sells GOSH polishes. I've seen swatches of this everywhere and people have been praising it up in the clouds, so it would be a really fun polish to try and have in my new but growing collection. I would like to win this because I am obsessed with holographic nail polishes but I haven't been able to get a hold of any of the "good" silver holos like China Glaze "OMG" or the Nfu Oh 61 or this one. And supposedly, this one is the best out of all of them. I don't have access to this brand in my country so I would really appreciate it if I won. I would love to win this polish because i cannot buy it in the U.S.
4. In my country we can't shop this brand, and I have been looking fot the perfect silver polish for a long time, and I have liked this a lot! -I'm a follower as Colourful World by GFC. -I love nail polishes and i don't have any Gosh polishes and I really want, also I haven't seen this nail polish anywhere around where I live. I have lemmed this polish for ages. I have an obsession with holographic polishes. I have all of the polishes from all of China Glaze's holo collections but nothing that comes close to the awesomeness that is Gosh holographic. I try to find it online all the time to no avail. I love this colour polish, i don´t have anyone like this. I absolutely love holographic polishes, but I don't currently own any. My searches for GOSH, China glaze and nfu.oh holographic nail polishes have been horrid stuggles, especially because the only places that have them don't ship to the US. I was very close to getting an nfu.oh polish until I found out that the site has a lot of credit card fraud problems. This is probably the only chance for me to get this little beauty! :D Thank you for this giveaway!!! i follow you on google (julie anne) and on my google reader! i have drooled over this polish too much. it is virtually impossible to find! I looove holos, & I think this is one of the prettiest ones ever! Plus it is impossible to find for purchase. 3. reason I'd like to win... I love holo/prismatic polishes. I have just a couple. I also have no Gosh polishes. How great for that to be my first! I am a GFC follower of yours as Sassie08. I would LOVE to win a bottle of Gosh holographic because it is such an amazing polish and I'm in the US- I can't buy it here! Gosh REALLY needs to bring their polishes to the US!! I'm such a magpie and I simply adore anything holographic. I don't have a single favorite color, I love them all, and this polish has them all!!! I'm a follower via GFC "LacquerObsession"
I would love to finally get my hands on some holo! Like everyone else, I'm a holo addict. But I've only managed to get a couple from the OMG and Kaleidoscope collections. I need a linear silver holo and this one is gorgeous. I'm not sure how I would get it any other way. I can't find ANY holo polish anywhere! Am I looking in the wrong places? Or maybe I can...on eBay...for a LOT of money? :P In any event, so glad to have found your blog - beautiful photos and great reviews! I really wouldnt know where to find this but I love its holo. I'm a follower with moondancerjen. Email is moondancerjen(at)yahoo(dot)com and I blogged about this contest here: http://moondancerjen.blogspot.com/2011/03/giveaway-roundup.html I have been seeing this color used on konadicures all over the blogisphere and i want it SO BAD!!!! I hate that I'm late to the trend and it's so hard to find. Email: gothampolish (at) gmail (dot) com. I can't find this color anywhere, and it is amazing!!! I would like to win this polish because one its a B.E.A.U.T.I.F.U.L polish and its a big lemming for me, I am a holo freak, and secondly I can't get it here in the US. OMGoodness this is like the Holy Grail of Holos & it's not available in the USA it looks like FABULOSITY in a bottle. I envy anyone that owns it. I follow via GFC as Macca. I follow via GFC as melanie_douse and my email is melanie_douse@hotmail.com. I would love to win this polish as i'm a huge fan of the holo polishes and Gosh so I think it would be a great polish to have but I haven't had any luck finding it anywhere gosh polishes are sold near me. I would love to win this polish because I am holo vigin, never had any holo's before. I have always been iffy in regards to them and I think that GOSH which every one loves could help sway my opinion. I follow with GFC as Etra. I would love to win this polish because I am searching for the perfect linear holo! I'd love to win this because believe it or not I do not own a silver holo polish!! Why I want this polish: I actually have seen very few holographic polishes (only 2 to be exact) that make me go "whoa." Unfortunately I realized rather late that GOSH isn't (to my knowledge) sold in US stores especially not in Ohio. Reasons why I want it oh so badly are: 1)Basically, I'm desperate. 2)I want people to stop and stare. You know possibly wreck their vehicles/ drop their food etc. 3)I'm addicted to collecting nail polish and I want you to enable me. I've must been living under a rock or something because I've just been introduced to this amazing polish (and all holo's for that matter) via your blog! It is so different and so unique and I've never seen anything like it... I have to own it! I too have long natural nails and love your swatches for that exact reason. I can tell this polish will look great on and i'm thinking of all the possibilities it poses! I've never seen anything like this in any store near me... and since this post, I've searched. Must not be US friendly... stop my search and help me out with a little winning! Would love to get this polish since you can't find GOSH in the States! I'd love to add to my collection of linear polish...so far I only have 1. =( It is SO hard to find this polish here!! We have GOSH but never the holographic one. And I've looked EVERYWHERE! Very hard to find and when you do it's very expensive, ie Ebay. i want this polish because, while stores in my province sell gosh, they have NEVER carried this color, and i need a true silver holo!! Oh, I would love to win this polish so much!! The only place I can find to get this is on ebay...for $30-$50! I would love to win this polish because not only would it be m first gosh polish it would be my first holo. This is polish is hard to get ahold of in the US. I follow via GFC as Annelise. I've never been able to find GOSH here in Idaho and would love the opportunity to win this polish! 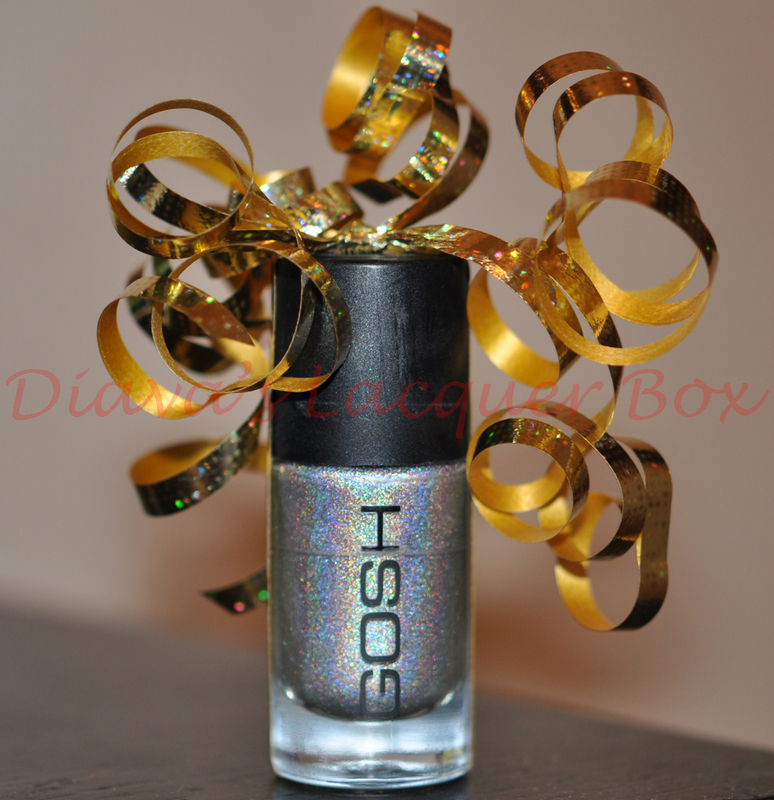 I want to win this because I love holos and I haven't been able to find this brand locally! i cross my fingers, thanks again ! I'd love to win GOSH holographic because in Spain I can´t find GOSH and I haven´t got any holos in my polish collection. I'd love to win this because GOSH holographic is my ABSOLUTE #1 lemming, gah, and I can't afford it at the price the ebay scalpers charge. Thanks for the opportunity! Amazingggg I love this holographic giveaway!! I haven't been able to locate this polish, would love to win it, I don't have anything like it. I really love it, it's one of my lemmings:)! This is what a mean for a TRUE holo!and it's impossible to find in my country.. I just started obsessing over nails and cannot get this in the US!! I only own 2 other holo's and I'm totally addicted. i would love to win because i don't own any linear holos and have never seen gosh anywhere i have ever shopped. haven't been able to find this, and when you do it's really overpriced on ebay! 1. I follow under "Karen"
4. I have been wanting a silver holo for the longest time, but I can't find ANY that isn't discontinued or overpriced on Evilbay. I would like to win this polish because it is beautiful and I don't own any holos yet. Why I'd Like to Win: I was hugely into nail polish as a teen, but towards the end of my teenage years I go to out of it. When I finally got back into it, it was after all the holographic polishes were out and readily available. I don't have any holos polishes. :( I realize how beautiful they are and would like to have at least one polish in my collection. Especially a polish that's this beautiful. I would like to win this polish because I don't own any holographic polishes and I can't find GOSH products here in my country. Thank you so much for having this fantastic giveaway! My follower name is beauty2244, and my email address is beauty2244@yahoo.com. This polish is my holy Grail of all polishes. I live in the US so it is next to impossible to obtain this polish, unless I fork out $40 on eBay!! This polish looks amazing and I would treasure it forever!! Also I'm a new nail blogger. Please check out my site while you're there. http://nail-loopy.blogspot.com/2011/04/cool-giveaways-you-should-check-out.html im a fairly new blogger so if you want you can have a look. I am crossing my fingers to win this polish! Can't get hold of it ANYWHERE in Cali! I would have to literally fly to the UK and do a hunt (polished and all!)! If I win this, that polish would stay on my fingers for at least a month (that is saying a lot; I change my nail polish every other day)! yayyyy this is the best giveaway!!! I live in the united states and unfortunatly we cant really get gosh polishes here except for really expensive on ebay. I would love to have this one i love holos and this one is just so beautiful!!! Thank you for sharing it with the lucky winner!!!! I would be absolutely ecstatic! I'd like to win this polish because I'm running low on my China Glaze OMG. Gosh Holographic looks like the improved version of OMG so it'd be great to have! Since I don't live in the US I don't have access to it. I follow via GFC as Lorene. chocolatemama314@gmail.com I would like to win b/c im a polish newbie and this would be my first holographic polish and its so prettty. I would love to win this polish as it isn't available in the US, where I live. I've searched blog sales and everywhere for it to no avail. I would love to win this polish because I've never seen anything like it! It's gorgeous! And I haven't seen this brand where I live either. I'd like to win it, because in my country I can not find! Moreover, it is lovely and my nails so much desire it! I have been coveting this polish since the first time I saw a swatch, and as we don't have GOSH polishes here I have had to stick to coveting. Hello, I just started to follow your blog. I think your nails are really pretty, long and neatly polished, good work! I am so stoked about this giveaway because I haven't got a real holographic polish in my collection yet and I scour every drug mart I pass by in my city for it! Good luck everyone! I really want to win Gosh Holographic because I haven't been able to find it anywhere! It looks so beautiful. I'd love to win this polish because it would be my first holo ever! I am new to nail blogging and it would really add to my growing collection. I'd love to win it because I always have painted toenails but I don't have any quite like this one! It's so pretty and unusual. ^_^ As for it being hard to get hold of, I don't know, but I've never seen it for sale here in Australia, maybe I'm not looking hard enough? I'd love to win this polish because it would be my first holo ever! 1. follow via GFC as Jessica D.
3. no twitter or blog! Why? B/c I'm a holo hoar! I think I became addicted to nail polish AFTER the holographic craze; so I am unable to find any! I actually don't have any holos! I've been craving a linear silver holo but I don't think the gosh brand is available in the US! Why I want it: Gosh is a European brand which is basically impossible to get in the US! I loooove holo's and have had trouble finding a good linear holo without shelling out the money for Nfu-Oh polishes, I'd love to have this in my collection. I haven't been able to find this polish anywhere! I have such a lemming for this polish! I can't find it anywhere :( I don't have any holo polishes so this would be a welcome addition to my stash! Would love to win this cuz it BEAUTIFUL!!!!!! !